I have haphazardly been checking of a nonexistent list of astronomical phenomena for most of my life….. Went for a drive in Martty the other morning and got to check of one more. 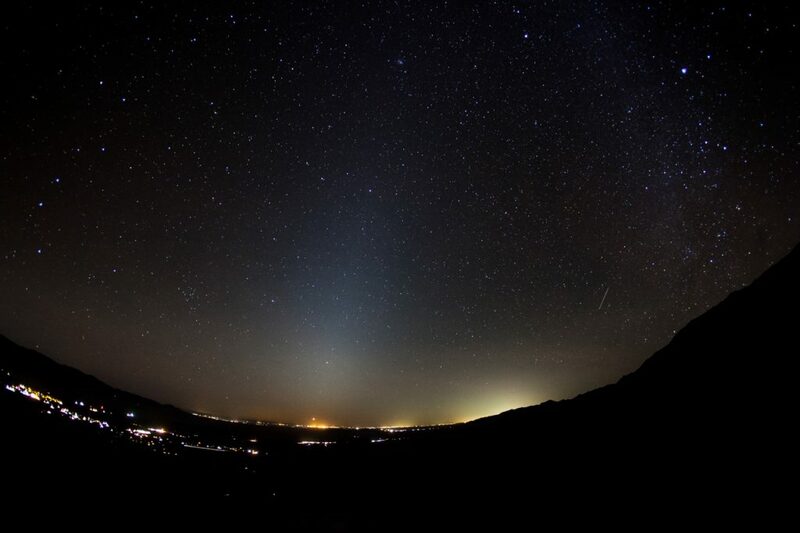 Zodiacal light. It is a fait, soft, triangular white glow that has its base at the horizon and reaches up about a fist or slightly higher. Most typically seen at sunset in the spring, or at sunrise in the autumn (flip that for Australia). Since it is so faint, it is better seen well before dawn, as sunset can linger a bit long for it to be seen. Also, no moon. The moon, at almost any phase will wash it out. What is it? It is sunlight scattered on interplanetary dust along the zodiac plane…. The orbits of the planets around our sun ‘collect’ the dust into the zodiac plane, the dust is tiny, between 10 and 300 micrometers, so it takes a lot of them to be ‘visible’ and it takes just the right light to reflect off them. Right, so that’s what it is… Here is how I saw it. Went for a drive before daylight saving kicked in. I wanted the dark specifically because it is really peaceful to drive in, and I knew that once DLS kicked in the following week, it would be sunrise well before I got home. The usual ‘not sleeping’ was the reason for the up and drive, I never set an alarm, I just let me tell me if me wants to go for a drive or not. Out the door by roughly 4am in this case. I did not even look to see if there was a moon or not. If I am driving to be somewhere by sunrise, or to fly the drone, I have a set path in mind, in this case, not so much, just drove out the street and let Martty take a few turns before I settled on Borrego Springs. It was cold on the way out. Often is. It’s always coldest just before dawn. But, like most drives to the desert, once you get over the other side of the valley, it soon warms up. Once at the look out, we always stop. Always. We just do. Uphill or down, you stop and look. In a moment or three my eyes adjusted to the lack of LED headlights and I started to see the stars. Straight away it hit me that it was moonless night and well before any hint of dawn. 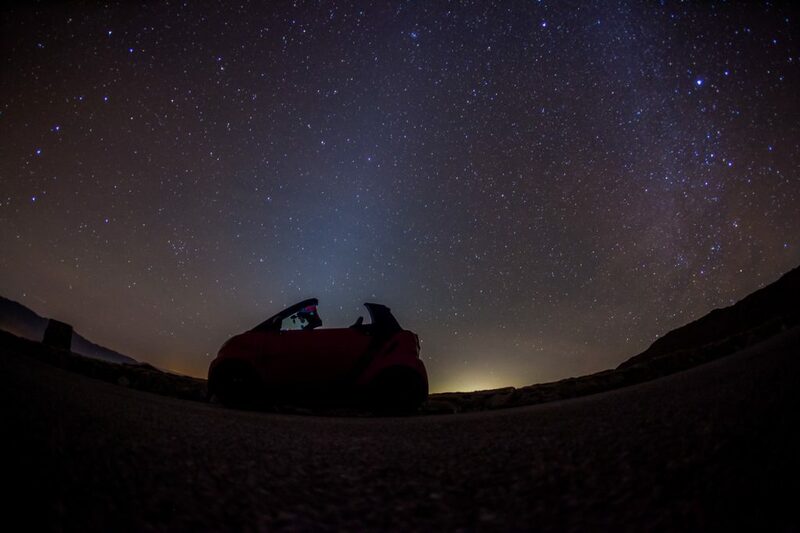 Because it was so warm it’s very pleasant to just sit on the wall and stare out into the lights of Borrego and the stars above. It was not long before I saw the zodiacal light. It was pretty obvious to me. Granted, I knew what I was looking at, but the fact that I did not drive there just to see it was the nice surprise. So, with all that, here is what I saw. The frustrating thing is that I did not take a tripod with me… I always always always take the camera on these drives, and often take the tripod, but for some brain fart reason, not this time, so I had to set the camera on the rock wall and just try my best to keep it steady. Took 3 photos, this one has the horizon lined up the best. This last one is for Martty. Just sat the camera on the road and let it do its thing. I have her winter doors on at the moment, bit of a shame, as it would be super to see the light through the car…. So yeah, pretty happy to go for a drive, you never know what you are going to see and very happy to be able to check that off the list. Todays the big day if you are State side. If you are not stuck in traffic, you might want to take the easy way out and watch the eclipse online. Here is a nice write up on some of your options. I personally am going to open a few tabs and see which is the least obnoxious. I have a horrible feeling that they will try and make it like a typical USA sporting event and shout every second of the event… Coupled with 1 second cuts to nothing related to the celestial event…..
Wow. I sound like two grumpy old men. This one caught me out…..
To solve ‘duck curve,’ Missouri utility to pay bonus for west-facing solar panels. Fantastically simple. Sure, not everyone has west facing roof space, but why not incentivize those that do and are thinking about adding solar? The biggest problem with the duck curve is that evening ramp up. As the sun sets, the people go home and the solar output really drops off, the power companies have to fairly quickly ramp up megawatts of generation, sometimes even getting close to a gigawatt. A west facing solar panel will put out more power at sunset than a north or south facing one (the usual direction). To be clear, it will NEVER solve the duck curve. Only storage will, but it is a small step in reducing the steepness of that curve up the ducks neck. The solar eclipse on the 21st is getting some press over here. I liked this guys take on it. In short, he thinks there is going to be a whopper of a traffic jam. Traffic, along with weather, will be the chief challenges for people wanting to see the total solar eclipse of August 21, 2017. I analyze how the U.S. population is distributed with respect to the U.S. road network and the path of total solar eclipse to predict how many people will visit the path of totality and the resulting traffic congestion. Using advanced ArcGIS.com software by Esri, U.S. Census data, and a road network model of every street in the USA, I present estimates for where people will gather for the eclipse and in what numbers. The main reason I love this guys article is because of all the data he pulls and uses to make his point. Duno. I will not be amongst it. I do not have the holiday time, I don’t like crowds and I have more (to me) interesting things to watch – like the electricity grid.